Girls, sixth season: get used to the end | TV Tips – Which tv Series should I watch next? Girls, sixth season: get used to the end – TV Tips – Which tv Series should I watch next? No matter what I do, no matter whether I start a new nuclear missile crisis with my emotions, or I sit back and chill and give someone a fruit basket, I can only control the mayhem that I create around me. But the crazy thing is, when I showed up, I heard screaming and I heard my name and I heard madness. And I knew that I was free. At least for tonight. I was sure that Lena Dunham has reached her very best in writing by the fifth season’s finale of Girls. But the sixth season’s premiere was eventually aired (and it was 40 minutes long!). All I Ever Wanted is flawless and so well balanced it has been the very first episode of Girls to leave me with just love for Hannah Horvarth. It comes after six years of love and hate toward this uneasy character. Aversion at first (on screen) look is gone. Goosebumps are already there during the first minute and an half of the episode, while all the series’ main characters are seen one after the other reading Hannah’s story. Losing My Best Friend To My Ex-Boyfriend has been published by the New York Times, and I could not be happier about it. I was smiling, and Hannah’s typical glancing into the camera didn’t bother me anymore. It may well be because we have to part forever in a few weeks, and I am conscious I am going to miss her. Still I support Hannah all the way, while I follow her to the Hamptons where she is heading to to report about a surf camp for wealthy ladies. That monologue, the unforgettable monologue by the end of the fifth season, changed everything. Jessa and Adam, the whimsical Marnie, after all of that Hannah is Hannah, period. It does not matter her being psychotic, flawed and vicious. 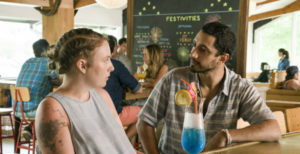 I just felt pure joy by watching her hanging with her surf instructor (the great Riz Ahmed already seen in The Night Of) in search for some happiness and optimism. Even Hannah Hovarth can quit hating everyone and everything, why shouldn’t we? “It’s so much easier to love something than to hate it, don’t you think? Hannah has gradually changed. The character gained control, moved toward introspection and found a brighter smile. Is it to last? Hard to say. Besides the feelings, facts are that a writing quality like the one achieved on this episode will grant to Leena Dunham a excellent closure for one of the most discussed series of the last years. She is witty, cynical, but also sensible and truthful: her writing echoes her nature. Has she been outrageous or excessive? Let’s be honest: what many find to be footling, it is what they would very well say after a few glasses of wine. Lena says it loud and clear. Lena shoves her imperfect body right into our face all along Girls, or while she models for fashion magazines: cellulite has got to a fashion cover. That body should be perceived as a it is, a human body that hasn’t been fiddled by Photoshop. As similar to the body of many of us, it should not be welcomed with displeasure. Not everyone is obsessed with workout, diets, beauty products and healthy food. Lena does not feel ashamed of her fears or imperfections, she lives her sexuality genuinely, in that being a role model, and making me kinda jealous. I will not shun the topic: I wish I was brave enough to wear a dress that does not fit my body according to the common opinion, or to be with others leaving out the constant struggle for a perfect pose, the effort to hide those little flaws I fight every day. I do prefer the chubby Hannah, her frayed tattoos, her ruffled hair, her large clothes, to Marine and to Jessa in their perfect shapes and shiny hair-does. Hard as it can be, it is time to get used to the end. This last season will pass quickly, while a struggle lasted five years between love and (way more) hate winds up to loving harmony for me and Hannah. Today I would love to watch her on and on finally without contempt, instead of getting ready for a farewell. We needed time, Hannah, but it has been very well spent.